The elbow joint is an inherently stable joint, but its dislocation is very common, with a reported incidence of 5.21 dislocations per 100,000 person-years (Stoneback et al., 2012). Stable reduction and favorable functional outcome are frequently acquired in patients with simple dislocations with incidence of residual instability of less than 10% (Anakwe et al., 2011). External rotation and valgus movements of the elbow with axial and posterolateral forces easily result in rupture of the lateral ligament complex until the medial side, leading to posterolateral dislocation of the elbow (O'Driscoll et al., 1992). Lateral dislocation of the elbow is rare and a few studies have been reported on this injury (Kini, 1940; Linscheid and Wheeler, 1965). Clinical and radiological findings make this injury easily diagnosed and standard treatments for this injury usually work well. 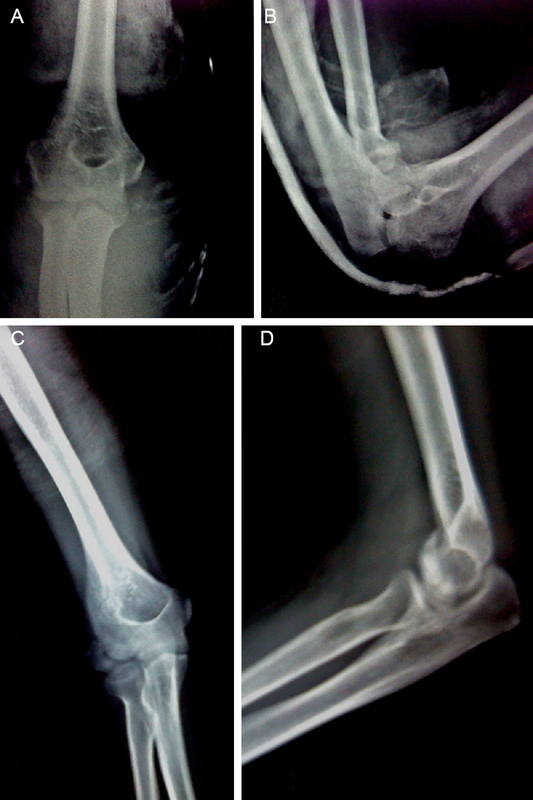 This article aims to highlight the diagnosis, management, and potential complications of the rare lateral dislocation of the elbow. A 37-year-old male patient presented with injury to his right elbow due to a fall from height into a heap of sand and landing over the lateral aspect of the right elbow. He did not know the exact position of the elbow at impact, but swelling, deformity and disability of the limb were evident. The right upper extremity was supported by his left hand and he was brought to the nearest appropriate health care facility in which he was given first aid treatment followed by certain medication for pain and abrasions. Then he was referred for further orthopedic care. There was swelling and tenderness at the elbow with painful restriction of motion; however, the distal neurovascular status was intact. The anteroposterior radiograph of the elbow revealed that the elbow was dislocated in the lateral direction with increased joint gap and the lateral radiograph of the elbow revealed that the humeroulnar joint was in the non-concentric position with small avulsed fragment laterally oriented. All these radiographic findings indicate lateral ligament avulsion, a lateral dislocation with lateral ligament injury ([Figure 1]). Figure 1: Radiographs of the elbow in case 1 showing the lateral dislocation of the right elbow with lateral ligament avulsion in the anteroposterior view (A) and non-concentric joint in the lateral view (B). Closed reduction under general anesthesia was planned to repair lateral ligament injury, but the patient refused for surgery and he only wanted his dislocation to be taken care of. After providing informed consent, closed reduction was attempted under short-time general anesthesia. A longitudinal traction along the deformity of the forearm was given by one assistant and counter-traction by another assistant by holding the arm. Under this condition, a medial force was applied by a surgeon to the forearm and a lateral force to the arm until an audible clunk of reduction was felt by the surgeon after few attempts. The accuracy and concentricity of the reduction was confirmed by an image intensifier ([Figure 2] A, B). Figure 2: Radiographs of the elbow in case 1 after closed reduction (A, B) and at 6-month follow-up (C, D), showing good and stable reduction. Note: (A, C) Anteroposterior; (B, D) lateral views. A long plaster backslab was given in this patient with elbow in 90 degrees of flexion and forearm in mid-prone position to support the elbow, and finger and shoulder movements were encouraged throughout the follow-up period. Increased swelling, pain or distal neurovascular deficits were closely monitored. Postoperative recovery was uneventful and pain and swelling was markedly decreased even at 3 weeks after the plaster backslab was removed for elbow physiotherapy. The patient was followed up at 3, 6 and 9 months and 1 year after surgery and dislocation did not recur ([Figure 2]C ,D). After surgery, the elbow allowed flexion and extension within 40-120 degrees and had terminal restriction. The avulsed fragment was however not united as shown by follow-up radiographs. The attempt for dynamic radiographic visualization was limited by stiffness and also refused by the patient. The patient did not complain of residual instability, and thus the requirement for stress radiograph was limited. The patient was pain free and could perform most activites of daily living but a full range of elbow motion was not attained till 1 year after which he was lost to follow up. A 60-year-old male patient had injury to his right elbow due to a fall from scooter, presenting with pain, swelling and deformity of the elbow. He had difficulty in using the affected extremity which was wrapped using a cloth sling by the patient. The clinical features and the treatment procedures of this patient were similar to the previous case, with uneventful reduction and follow-up. Follow-up time (8 months) was shorter and range of motion was better in case 2 than in case 1. The lateral ligament avulsion was not clinically problematic and was not fully united in the conservative management. 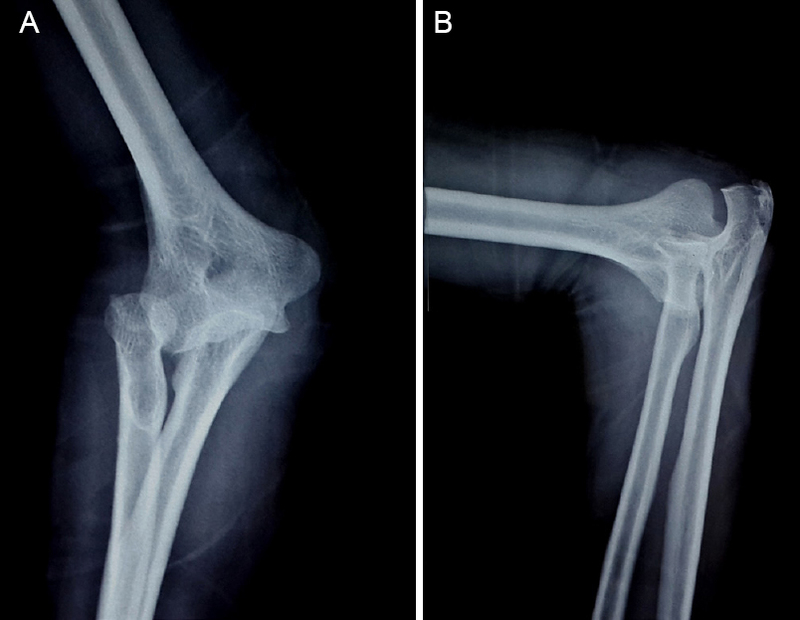 Radiographs of the laterally dislocated right elbow in case 2 on admission and at 8-month follow-up are shown in [Figure 3], [Figure 4]. Figure 3: Radiographs of the elbow in case 2 showing lateral dislocation of the right elbow with lateral ligament complex injury in the anteroposterior (A) and lateral views (B). Figure 4: Radiographs of the elbow in case 2 at 8-month follow-up showing stable reduction of the right elbow in the anteroposterior (A) and lateral views (B). Lateral dislocation of the elbow consists of dislocation in the transverse plane without antero-posterior element. One case of this injury was reported by Linscheid and Wheeler (1965) in 110 elbow dislocation cases and by Kini (1940) in 60 elbow dislocation cases. Three and one cases of lateral elbow dislocation were reported respectively in 342 and 45 cases (Schippinger et al., 1999; de Haan et al., 2010). Usually these injuries are easily reduced and managed well in standard fashion (Vijaya, 1966). The prone position and hanging arm technique has also been used successfully (Khan et al., 2008). As previously described (Gokcen et al., 2013), palpable reduction was, in this study, achieved by simple traction in the direction of deformity, lateral push of the arm, and medial push of forearm. Bilateral lateral dislocation of the elbow has been reported to have a good outcome following reduction under general anesthesia (Reckers et al., 2006). The reduction of these fractures is also sometimes difficult owing to various factors like swelling, interposition of bony or soft tissue structures or concomitant injuries. Anconeus muscle (Exarchou, 1977), brachialis muscle and other structures (Chhaparwal et al., 1997) after lateral dislocation of the elbow have been reported. We experienced uneventful reduction despite having avulsion of lateral ligament complex. The lateral ligaments are an important part of elbow stability in a ''fortress'' concept of dynamic and static constraints (O'Driscoll et al., 2001). Among the described static and dynamic stabilizers of the elbow joint, the major stabilizer against abovementioned forces is lateral collateral ligament, which itself is composed of three components. There is a possibility of residual lateral instability if lateral soft tissue management is neglected (O'Driscoll et al., 2000). Avulsion of lateral ulnar collateral ligament, leaving a bare area at its origin at lateral epicondyle, has been found to be a consistent finding in instability, necessitating reconstruction during management (McKee et al., 2003). The cases with symptomatic instability and active life are better candidates for surgical reconstruction as direct surgical repair is not possible in attenuated ligament complex following weeks after dislocation. Various tendon autografts like palmaris longus, plantaris, semitendinosis, and gracilis can be used. According to a report by Nestor et al. (1992), these grafts have to be placed at the isometric point and the center of rotation of the elbow. Surgical intervention for lateral dislocation of the elbow has been reported to have a good outcome (Lee and Teo, 2003; Sanchez-Sotelo et al., 2005). The arthroscopic plication of lateral ligaments has been attempted with favorable results (Yadao et al., 2004) but may require expertise. Strict selection of patients according to indications and surgeon's expertise, however, are the key to favorable results. GSD wrote and supervised the paper. AS was responsible for medical records and follow-up. Both of these two authors approved the final version of this paper for publication. Anakwe RE, Middleton SD, Jenkins PJ, McQueen MM, Court-Brown CM (2011) Patient-reported outcomes after simple dislocation of the elbow. J Bone Joint Surg Am 93:1220-1226. Chhaparwal M, Aroojis A, Divekar M, Kulkarni S, Vaidya SV (1997) Irreducible lateral dislocation of the elbow. J Postgrad Med 43:19-20.
de Haan J, Schep NW, Tuinebreijer WE, Patka P, den Hartog D (2010) Simple elbow dislocations: a systematic review of the literature. Arch Orthop Trauma Surg 130:241-249. 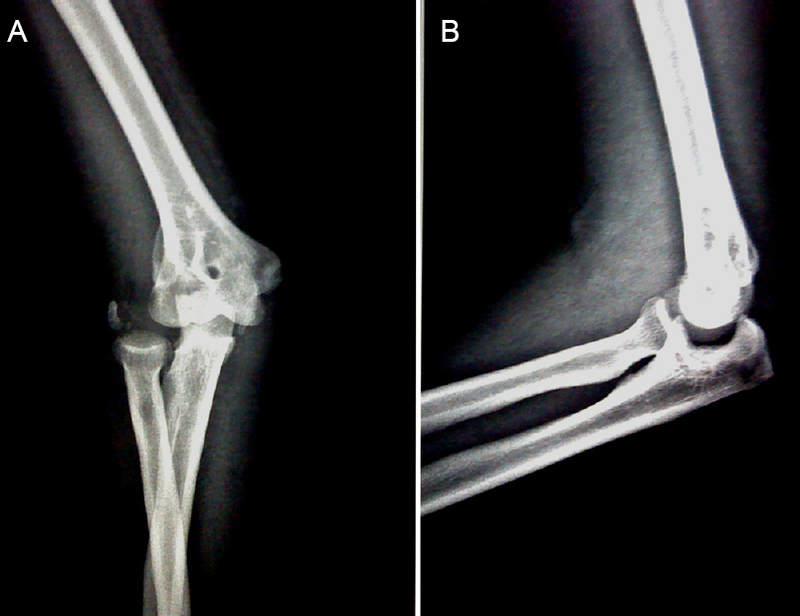 Exarchou EJ (1977) Lateral dislocation of the elbow. Acta Orthop Scand 48:161-163. Gokcen B, Ozyurek S, Atik A,Sivrioglu AK, Kaya E, Keklikci K (2013) Successful closed manipulation of simple lateral dislocation of the elbow joint: a case report. Oman Med J 28:466-468. 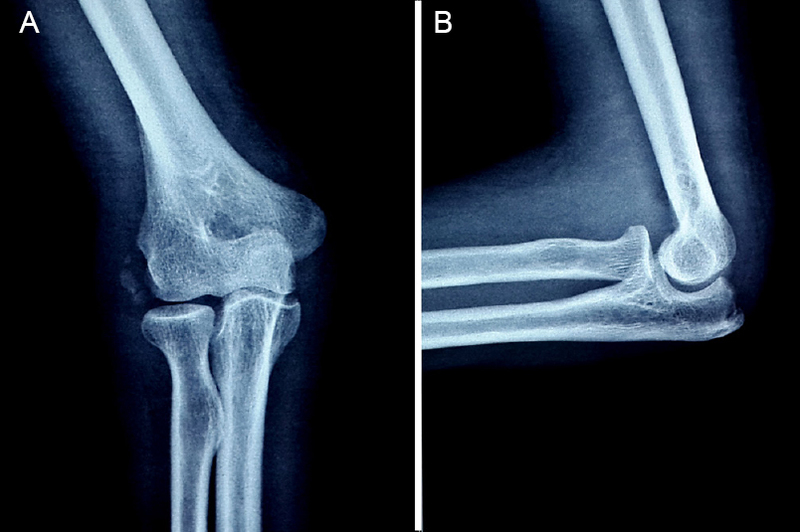 Khan SK, Chopra R, Chakravarty D (2008) Successful closed manipulation of a pure lateral traumatic dislocation of the elbow joint using a modified Stimson′s technique: a case report. J Med Case Rep 2:170. Kini MG (1940) Dislocation of the elbow and its complications. J Bone Joint Surg 22:107. Lee B, Teo L (2003) Surgical reconstruction for posterolateral rotator instability of the elbow. J Shoulder Elbow Surg 12:476-479. Linscheid RL, Wheeler DK (1965) Elbow dislocations. JAMA 194:1171. McKee MD, Schemitsch EH, Sala MJ, O′driscoll SW (2003) The pathoanatomy of lateral ligamentous disruption in complex elbow instability. J Shoulder Elbow Surg 12:391-396. Nestor BJ, O′Driscoll SW, Morrey BF (1992) Ligamentous reconstruction for posterolateral rotatory instability of the elbow. J Bone Joint Surg Am 74:1235-1241. O′Driscoll SW, Morrey BF, Korinek S, An KN (1992) Elbow subluxation and dislocation. A spectrum of instability. Clin Orthop Relat Res:186-197. O′Driscoll SW, Jupiter JB, King GJ, Hotchkiss RN, Morrey BF (2000) The unstable elbow. J Bone Joint Surg Am 82:724-738. O′Driscoll SW, Jupiter JB, King GJ, Hotchkiss RN, Morrey BF (2001) The unstable elbow. Instr Course Lect 50:89-102. Reckers LJ, Raymundo JL, Locks R (2006) Elbow bilateral lateral dislocation. Acta Orthop Bras 14:42-43. Sanchez-Sotelo J, Morrey B, O′Driscoll S (2005) Ligamentous repair and reconstruction for posterolateral rotator instability of the elbow. J Bone Joint Surg Br 87:54-61. Schippinger G, Seibert FJ, Steinböck J, Kucharczyk M (1999) Management of simple elbow dislocations. Does the period of immobilization affect the eventual results? Langenbecks Arch Surg 384:294-297. Stoneback JW, Owens BD, Sykes J, Athwal GS, Pointer L, Wolf JM (2012) Incidence of elbow dislocations in the United States population. J Bone Joint Surg Am 94:240-245. Vijaya S (1966) Lateral dislocation of the elbow joint. Singapore Med J 7:139-141. Yadao M, Savoie F, Field L (2004) Posterolateral rotatory instability of the elbow. Instr Course Lect 53:607-614.